P C Henderson, leading international manufacturer of door hardware systems, is pleased to introduce the innovative new Twinbolt system to its customers. This now enables the door to be locked internally at the top and bottom of the door by turning one handle 90 degrees, removing the need to manually engage two flush bolts. With over 90 years’ experience in the manufacture of door hardware systems, P C Henderson identified the demand in the residential architectural market for the Twinbolt, offering two points of discreet security with throw rods top and bottom. Designed for easy installation, this system unlike many others on the market requires minimal routing and additional adjustment to the supplied components, the Twinbolt offers many benefits to the joiner and the customer. 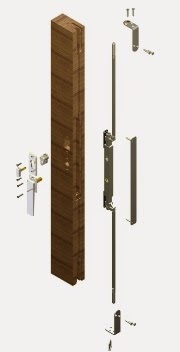 The new concealed locking system can be specified alongside Securefold accommodating a timber door weight of 100kg for exterior applications. A sleek handle provides a modern and stylish finish. Routing detail cover strips can also be specified in three colour options of black, white and brown to match the door finish. For added security and convenience Twinbolt incorporates the Yale Securiturn™ Removable Thumbturn. This provides the flexibility of a keyed cylinder lock when required whilst allowing the use of a thumbturn for everyday convenience which can easily be removed when required by using the specialist tool provided within the kit. Henderson products are designed with ease of installation in mind and also durability to provide the upmost value for money. P C Henderson’s online EXPERT service is totally free and offers fast and accurate specification and a no obligation quotation for all projects.